Discover the best Villas for sale in Javea with Paradise Real Estate. The elegant Project is located on the beach of Ambolo, Javea, considered one of the most prestigious areas of the Costa Blanca. It faces south, maximizing sun climate control and allows you to enjoy the best views. It accessing the upper floor of the house, in the entrance hall opens to us a beautiful sea view. On this floor is located a parking area for two cars, chill out terrace, staircase and a lift that allows us to enter into the house. Down to the first floor we find the bedrooms sector with a total of 4 rooms, all with private bathroom, built-in cupboards and privileged sea views. Three of the bedrooms also enjoy independent access to its own terrace. If we go down another floor, we go into a luxurious living room, through it we can access the large terrace with an infinity pool of 14x6m. Here the eye flows through the water surface and merges with the sea. Also on this floor it is a luxurious designer kitchen with all the latest equipment technology. Finally, on the top floor, the recreation area is located with your private spa, indoor heated pool, cinema room and access to a beautiful terrace. The outdoor living spaces have a unique design with a variety of textures, materials and vegetation that frame and enhance the beauty of the surroundings. The housing is designed with high quality standards, using the best materials and all are quality finishes Porcelanosa. The house has a home automation system and integrated control, automated blinds, underfloor heating, air conditioning, carpentry with double glazing to ensure the comfort of home. And to ensure their safety, a system of security cameras and access control is installed. This villa of 460m2 + 168m2 terraces will be built in remarkable quality on a unique sea front plot of 1.250m2 in the beautiful region of La Granadella with access to the sea. The villa has 4 bedrooms, 4 bathrooms, office, double high lounge/dining, kitchen, A/C, floor heating, domotic system, elevator, infinity pool of 12m x 4m with sunken chill-out area. All fittings are in premium PORCELANOSA quality. The property enjoys spectacular sea views. This elegant and sophisticated villa is located on the beach of La Barraca, overlooking the sea and the island. The prime location and unique design of the house allow you to enjoy beautiful sea views from every room. You access to the house by the upper part, the hall offers a panoramic view of the surroundings and the sea. At this level, there is also covered parking for two cars. To enter the house, we can either go down the stairs or take the private elevator. Upstairs, three very comfortable and spacious rooms, each with private bath and closets. The master bedroom also has a large dressing room and access to a beautiful terrace with spectacular views. On the second floor we enter a magnificent lounge with large windows that fill the room with light and create a unique atmosphere. Again, we have a beautiful English garden that gives a distinctive touch to the house. The modern and comfortable kitchen has all the latest technology devices and also has a large laundry room. Finally, on the lower floor is the spa area with all comforts to relax, have a direct access to the terrace to enjoy the great views. Spa facilities include a heated pool, jacuzzi and sauna. Also on this floor a further bedroom with dressing room, bathroom and access to the terrace and finally a spacious room that can be used as storage or office. The outdoor living spaces have a unique design with a variety of textures, materials and vegetation that surround and enhance the beauty of the environment. The advantage of this project is to build a house to your liking and create a unique environment to meet your needs, in an area of Javea. Location, location, location! This south facing villa is steps from the port of Javea and short walk to the historic town centre. Set on three levels, there are stunning sea views from the top floor. This floor is solely for the master bedroom and has beamed ceilings, enormous wardrobe space, en-suite bathroom and private sun terrace. On the main floor, which is reached a wide, roman stairwell are two more bedrooms which share a bathroom. A large and open living/dining room with fireplace and a newly fitted, comfortable and beautiful kitchen with pantry and wash/utility room with access to the back yard. The lower level is reached via internal stairwell or from private entrance and is a separate apartment with one bedroom, bathroom, kitchen and living room. There is a garage which is currently used as gym. Outdoors there is a pool, low maintenance garden and driveway. The south facing villa in the port of Javea has undergone recent complete refurbishments including all wiring and plumbing, and is still undergoing cosmetic work on the exterior. This is a unique project of luxury villas reflecting the modern day requirements of today and can be custom built according to your own requirements, taste, and most importantly budget. La Cala is a prestigious urbanization ideally located in a popular area of Javea. Named after the Spanish Word for Cove, due to its idyllic location surrounded by sea with various secluded award winning beaches close by, this exclusive urbanization offers everything you could want for your perfect home with shops, bars and restaurants all within walking distance and a short drive to the centre of town including a local service. There are various plots to choose from with mains gas, electric, sewage, phone lines and post on site. All plots are approximately 1000m2 in size, ready to construct according to your own requirements and desires at a competitive price. Unique chance to own a detached villa with fantastic views on a large plot. It´s centrally located between Javea´s and Denia´s beaches and a 2 minute drive to either the town of Gata or Pedreguer. The villa is all on one level and on relatively flat plot so no problems with steps and such. There is sun all daylong and even though there is no pool, there is a large jacuzzi and plenty of space to build a pool. You enter the property through the large, covered car port and into the front yard and chill out areas. As you walk into the villa to your left is a dining room from where you have these magnificent views which on a clear day even allow one to see the island of Ibiza mountain tops on the horizon. The comfortably sized living room leads to the kitchen, two bedrooms and bathroom. There is a back door from where to have easy access to the lovely outside kitchen and grill which is an excellent chill out area. The gardens surrounding the villa are of low maintenance and are well-kept. The villa could use some TLC and upgrades but is currently lived in comfortably by its owners. Two bedroom villa for sale only 57m from the golf course in Javea. The villa of 140m² construction sits on a 762m² flat south facing plot. furthermore the property features a large driveway for two cars, garage and pool with terrace around. Promotion price from the bank only for a short time. Enquire now for more details. Resting near to Javea's golf course, on a cul de sac and up on a hill, is this lovely villa on a large flat plot offering great open views over the country side and mountains. It is just a short drive to the historic old town, the beaches and to amenities, yet set in a very tranquil road and there plenty of space in an enclosed plot. Indoors it's bright and cool with terracotta tiles throughout, a log burner fireplace, double glazing and has all been recently refurbished. The ample kitchen is very comfortable. Outdoors is a large 10x5 pool and sunny pool area and there is an extra large plot which could be ideal for a stable or fruit orchard. Villa for sale in Javea, 1 km from the sandy beach and services, situated in Toscal area. It consists of lounge diner, kitchen with utility room, 3 bedrooms, 2 bathrooms, gas central heating, windows double glazing and glazed naya. Plot of 700m2 with 140m2 built, swimming pool 8 x 4, garage for 1 car and private parking. Villa for sale in Javea, in Costa Nova urbanization, very quiet and residential area just 5 minutes from the sandy beach and all services, within walking distance to restaurants. Built in 2 independent acommodations. The main house comprises of lounge diner with fireplace, open plan kitchen, 2 bedrooms and 2 bathrooms (1 en suite). Independent Studio with living room/bedroom and bathroom. Central heating all throughout, double glazing, private garden, swimming pool 8 x 4, BBQ area and private parking for 2 cars. This beautiful two bedroom villa for sale in Javea is located in a quiet area only a few minutes from the beach and all amenities. The property is entered through the main gate with drive way and its own carport leading to the main entrance through the covered terrace which features a lovely seating and chill out area perfect for enjoying warm summer days in the shade. The main door takes you to the lounge and dining area with fireplace, ideal for cosy winter evenings. The property also features central heating throughout. The entrance then leads into the fully equipped kitchen with a laundry room that has its own separate access to the garden. A corridor leads from the entrance to the two spacious bedrooms one with en suite bathroom and a separate bathroom with walk in shower. The naya opens onto the pool and terrace area with lots of space for sunbathing and enjoying the sunny lifestyle of Spain. The villa is surrounded by an easy to maintain garden. There is a roof terrace with a lovely chill out seating area enjoying fabulous open mountain and countryside views. This villa located in walking distance to supermarket, Arenal beach and other amenities. The villa is surrounded by a lovely lawn garden with entrance via a tosca sweeping staircase to a spacious glazed naya with terracota floor tiles. This leads to open plan dining room and lounge featuring attractive fire place. Accommodation on one level enjoying gas central heating, modern kitchen and bathrooms and 3 good sized bedrooms. Outside there is swimming pool with secluded and not overlooked private garden. This homely villa in a`popular urbanisation, is on the border of Javea and Benitachell. There is a ramp for pool access available and in the past this villa has been enjoyed by a disabled person. Originally built on one level, the curent owners have refurbished it 10 years ago by adding lower floor featuring an appartment with seperate access. Main entrance into a welcoming hall with access to an open plan dining and lounge area, with open plan newly equipped kitchen. From the lounge there is access to the stairs leading to the lower apartment. Upstairs further hallway leading to two bedrooms and 2 bathrooms. Master bedroom opening to a terrace with fantastic views over the mountains and the Montgo. Outside the villa is sourrounded by pleasant garden featuring a swimming pool, BBQ and a Spanish Potenca to enjoy those long suny afteroons with friends and family. On the lower for there is a lounge area with equiped kitchen, bedroom and a bathroom. The property offers good value for money in a quiet location. Immaculately presented 3 bed villa for sale in Javea. The villa is set on the edge of a zona verde in Costa Nova a popular area of Javea. The villa all on one level is entered from a few steps through the glazed naya or with a flat entrance through the kitchen. It has a master bedroom with en-suite shower room, two further generous double bedrooms and a family shower room. The villa has a lounge with beamed ceilings, a recently installed pellet burner fireplace and views across the pool, a Tosca arch leads to the recently extended and modernised kitchen / diner. The villa benefits from hot and cold air conditioning, built in wardrobes and open views to the zona verde. Outside you will find the open terrace with awnings and the swimming pool and sun terraces, the remainder of the garden is Spanish in style with low maintenance Mediterranean plants. There is a garage and lots of parking even enough for your RV or boat. Great holiday villa with huge rental potential, or nice all year round living. 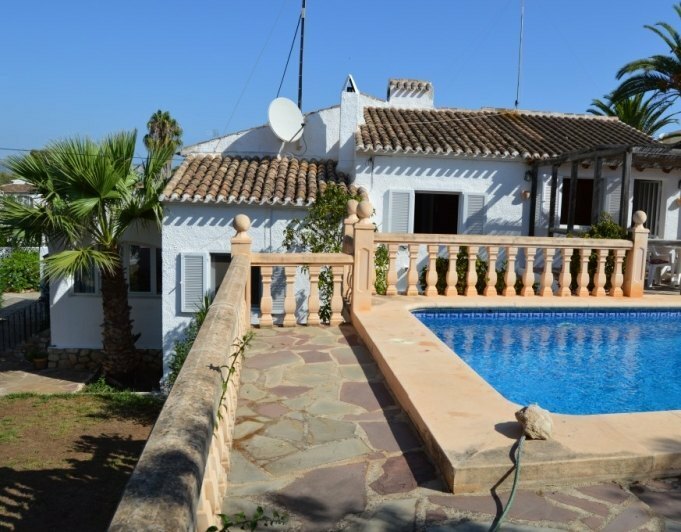 This lovely traditional Spanish villa with sea views and views to the Montgo is located in the Toscal area of Javea, 950m walk to Caleta de Dins rocky beach and 2.4km to the vibrant Arenal beach and restaurants. The villa is distributed over two floors and situated on a flat plot in a quiet cul-de-sac. You enter the property through double gates onto a driveway with parking for three cars, at the end of the driveway there is a double carport. There are three entrances to the villa, the main entrance on the ground floor, steps up to the glazed naya at the front or steps up to the kitchen at the back. Entering through the back door you arrive in a hallway, the first room is a spacious separate kitchen then further down the hall you enter the living room which has a beamed ceiling, feature fireplace with gas fire and sliding glass doors leading to the glazed naya. The naya is used as a dining and sitting room, it has sea views and open views to the Montgo. To the left of the entrance hall there is a hall leading to the house bathroom which has been modified for people with disability and then onto the very large master bedroom which has an annex used as a study, it could also be used as a dressing room. Down the internal staircase in the living room you reach the ground floor, to the left and near the front door you will find a large bedroom with an en-suite bathroom. To the right is another spacious bedroom, a shower room, a hall storage cupboard and a large room, know to the owners as the part room, this room could easily be changed into bedroom four with an en-suite bathroom. At the front of the property is the very private pool terrace, here you will find a bar built into the staircase and a large pergola ideal for for getting some shade. At the side of the property there is a large store room. At the back of the property there is a courtyard and a lovely spacious summer kitchen, there is also a laundry room built-into the staircase. From the courtyard there is a staircase taking you to the back door, but also taking you up to the spacious roof terrace which offers wonderful views to the sea and Javea port, here there is a structure to create a covered area.. The final part of the garden has steps up to a lawned area and a path leading to the gate into the carport. When we talk about Villas for sale in Javea, we are talking about a very specific type of villa but at the same time this can have some very interesting connotations and very important nuances that are worth noting in order that the buyer has the absolute certainty that they are making an investment that is really worth it. For those who want to invest or buy one of these villas that are for sale in the town of Javea, there is to say that all necessities you may need are close by to carry out a normal life without lack of services of any kind. In addition, it is also worth noting that, as a rule, the location of these properties is unbeatable since not only are they close to the beach but also in close proximity to major restoration areas so that leisure is assured or facilities accessed to all present location. A really interesting alternative with a relationship between quality and very attractive price so that you will not need to invest much money to have something attractive in an area as interesting as the Costa Blanca. At Paradise Real Estate we work together with many real estate agents in Javea and in other areas such as Moraira and Benitachell. Thanks to these collaborations we have access to hundreds of Villas for sale in Javea so we can offer you the type of villa you are looking for easily and quickly. Why buy a villa in Javea? If you are looking for a place to live all year round, buying a villa in Javea is one of the best options. In Javea you will improve your quality of life and that of your family from the first moment. For more than 15 years we have been helping all types of people to buy the best villas in Javea at the best prices and strong capital growth. Celebrations: Throughout the year you can enjoy different parties and events in the town ideal for the whole family. Climate: The climate in Jávea is mild all year round. It is not too cold in winter and in summer the temperatures are excellent for enjoying different outdoor activities or going to the beach. Culture and History: You can enjoy shows, concerts, plays and learn about the history of this fantastic town where there is much to tell. Schools: There are many schools that you can access if you have young children. In Javea you will also find English schools so that your children can continue their studies as if they were at home. Healthcare: Healthcare in Spain is known all over the world and Javea is not far behind. That's why you will have access to the best medical care in your own language. If you have decided to buy a villa in Jávea, this is the best time and at Paradise Real Estate we can help you make your dreams come true.